Enjoy close-up photos and read about Tai Shan, an adorable giant panda at the National Zoological Park in Washington, D.C., from birth through seven months. Watch him grow from a blind, nearly hairless, helpless newborn into a black and white furred, curious, growing young panda. This short book with cute captions will delight adults and children alike. Some of the highlights of Panda Cam include interacting with his mother, rock climbing, and experiencing snow for the first time. Tai Shan (peaceful mountain) was the first baby panda born at the zoo since efforts began in 1972 after President Nixon’s trip to China. 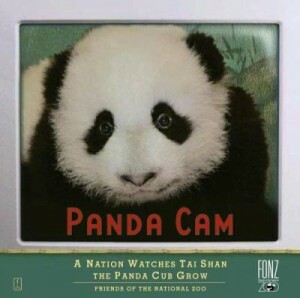 The photos in this book are selections from a webcam set up in the Giant Panda Habitat to continually capture and monitor Tai Shan’s progress. Tai Shan turned ten in July 2015. Watch his birthday celebration and other videos on youtube. 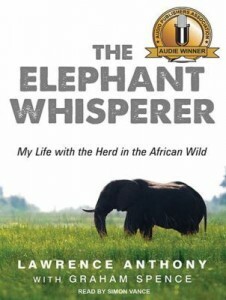 In this compelling book, Lawrence Anthony is asked to take a troubled wild elephant herd into his wildlife reserve in Zululand, South Africa, or they will be killed. The Elephant Whisperer deals with elephants learning to trust a man and life on the reserve with his wife and dogs, including handling poachers and the Zulu people. Lawrence’s bond with the matriarch Nana is particularly touching, especially when she brings her newborn baby to meet him. His engaging and sometimes humorous stories of life with the elephants made me empathetic towards their plight. The Elephant Whisperer will appeal to both animal lovers and adventure readers. The expressive narration by Simon Vance, a four time Audie Award winner, enhances the listening experience. Needing a change, Addie decides to move from Chicago to the small town of Eunice, Arkansas, after inheriting her Aunt Tilda’s house. Addie used to spend time each summer as a child with Tilda, but it’s been many years since she visited. Addie’s plan is to stay a few months to fix her aunt’s house up so she can sell it. However, after rescuing an abandoned dog she names Felix, becoming friends with Wanda Carter (who is the queen of sassy southern sayings), and falling for lawyer/farmer Jasper Floyd, she just might find it too hard to leave. Despite all this, Addie finds herself in trouble after she refuses ignore the fact that someone in Eunice is abusing dogs. Sit! Stay! Speak! 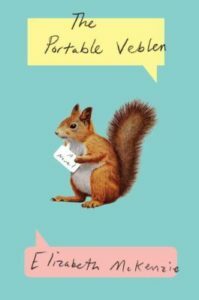 by Annie England Noblin is a cozy first novel full of charm, romance and quirky characters. Sergeant Stubby appeals to both military history buffs and dog lovers. This remarkable story follows James Robert Conroy and his brave canine companion, Stubby, from their early days to the battlefields of France during World War I, to their homecoming as heroes and then retirement. The soldiers’ lives during wartime are contrasted with the bond between soldier and dog. 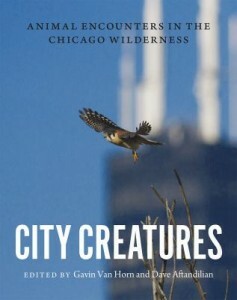 Photographs of Conroy and Stubby enhance the book. In 1917, Conroy enlisted in the Connecticut National Guard and his unit became part of the 26th (Yankee Division) of the U.S. Army. Stubby was a stray that showed up at training on Yale University’s athletic fields and favored Conroy. He learned how to follow along with the soldiers as they paraded on the athletic fields and even learned how to salute. Stubby was smuggled and stowed away on the ship taking Conroy’s unit to France. Supposedly after officers became aware of Stubby’s presence, Stubby charmed them and became the official mascot of the unit. 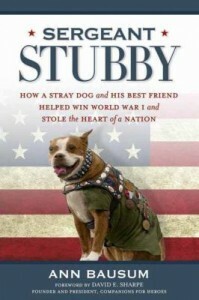 James Robert Conroy returned to the States as a hero and Stubby became a celebrity. Ann Bausum’s book was released to coincide with the 100th anniversary of World War I. If you are interested in reading further about World War I see All Time Faves: Our Favorite books about World War I. 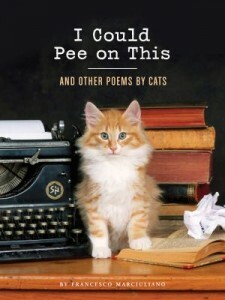 The title alone provides an insight into this heartwarming, hilarious true story. David Rosenfelt, author of the Andy Carpenter mystery series, is a bona fide dog lover. He and his wife Debbie adopted hundreds of dogs that were about to be euthanized from overcrowded Southern California animal shelters. They eventually started their own dog rescue foundation. When they decide to relocate from Southern California to their new home in Maine, the logistics of transporting their 25 mostly geriatric dogs seemed insurmountable. As Rosenfelt reaches out to his readers online and at book talks, he discovers some truly wonderful people who are crazy enough to want to be part of the cross country road trip. Eleven wonderful volunteers help transport the dogs in three rented RVs over five days. 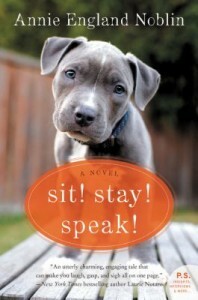 Dogtripping is a feel-good story that will have you laughing out aloud. Did you know that the cute cairn terrier that played Dorothy’s dog, Toto, in The Wizard of Oz performed in fourteen major motion pictures? This is a timely book to read since August 2014 is the 75th anniversary of the release of The Wizard of Oz movie (and check Bill’s review last month on other films of 1939). I, Toto, a charming book, is written from Terry’s point of view and is filled with photographs and newspaper clippings. Her first film was with Shirley Temple in Bright Eyes. 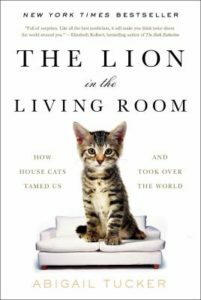 Other books about animal performers are Rin Tin Tin: the life and the legend by Susan Orleans and Zamba: the true story of the greatest lion that ever lived by Ralph Helfer.